You will recognize them distinctly in a crowd. Their favourite hang-out being the blocks around the Pudu bus station, which is one of the busiest areas in down-town KL. To many foreigners, when they think of Nepal, the image invariably is of a remote mountainous country with its snow covered Himalayan peaks, deep valleys, and Mongoloid people quietly tilling their hill terraced farms. When Malaysians think Nepalese, they think immigrant workers, strange food and a race that they sometime do not quite understand nor trust. Heck, when I walk through this part of town, I sometimes feel myself hanging on to my handbag, just a little tighter. This place has not changed much.. not even since the last time I was here with Cumi or the “fatboybakes gang” , to this Nepalese restaurant call the Khukri, which stands for the Dagger (or the Gurkha curved steel knife). 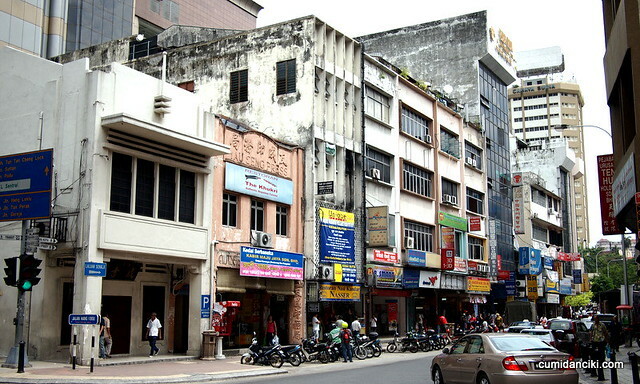 Jalan Silang is one of the older parts of KL town and is famous for housing many law firms, mobile phone shops as well as Burmese and Nepalese restaurants. There is also an extremely famous and popular beef ball noodle located within the vicinity known as Soong Kee Beef Ball Noodles, on Jalan Tun H. S. Lee. Anyway, all prejudices aside, I have to admit that walking along this part of town, I have never gotten into trouble nor felt my life under threat despite the dodgy surroundings. I think this area has cleaned up a lot, since 5 years ago. Also, Jalan Silang has always been good for the food and has never let me down, and that is why I keep coming back! Sometimes Cumi and I eat Burmese in the canteens around the area. We are surrounded by pleasant enough Burmese workers having their lunch or dinner break and we all eat in silence, enjoying the food and watching each other. Ah yes, totally at home in this part of town. Needless to say, I adore Nepalese chow and it really was, love at first bite. 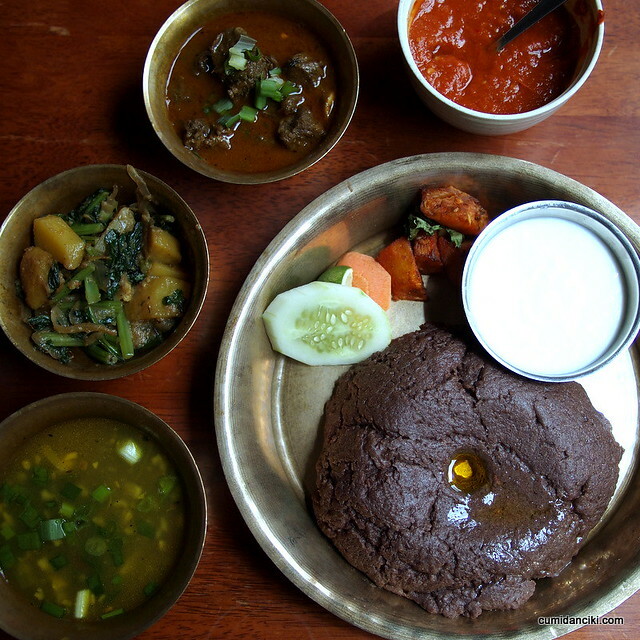 Nepali cuisine, also known as the cuisine of the Himalayas, bears its uniqueness by incorporating the two great culinary traditions of the region, Indian and Tibetan, into a mainstream culinary culture of its own. What they bring to the untrained eye (and stomach) is an odd cuisine that looks somewhat strange and tastes even stranger. 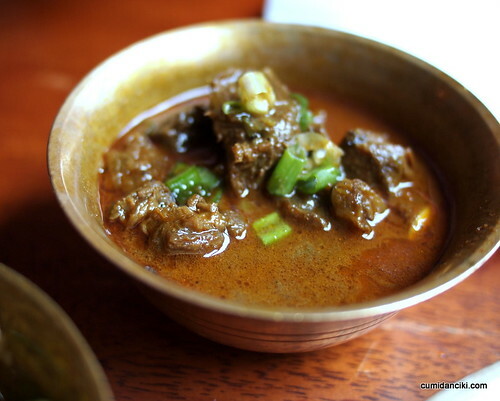 Whilst Nepalese cuisine is rather basic, it certainly does not lack in flavor, making extensive use of spices and flavorings such as ginger, garlic, coriander, pepper, cumin, chilies, cilantro, mustard oil, ghee and occasionally yak butter. Either ‘too bland’ or ‘too strong’ and ‘salty’ are terms used to describe this unique food. There is very little middle ground in terms of taste. Ah, so here we are. As the ‘monkeys’ triapse upstairs, we notice the red, worn carpet is still the same. Hot, and a little bothered and hungry, we were ready to start with the Momo. What is a Momo? They are dumplings filled with minced meat, served steamed or fried. A terrifically popular appetizer, afternoon snack or evening meal. We chose pork out off all the meat options, and rightly so. It was moist and fragrant with coriander and dry spices, and the skin was perfectly al-dante. The coriander and spices complemented the sweetness of the meat in the dumplings. Additionally we were served a soup with the momo. The strange, murky soup accompanying the dumplings was pungent, with a trace of gamy aroma to it. The Momo itself was savory, full of meaty flavour and rather strong tasting. It is actually a lot like the Xiao Long Bao only thing gamier and with more spices employed in flavouring the meat stuffing. Like I said, there is hardly any middle ground when it comes to flavours. Either rich and pungent or bland to a fault. This food is wonderful but takes getting used to. After the momo, things start to get a little more interesting. If you decided to order the weirdest looking thing on the menu, that would be the Dhedo khana. 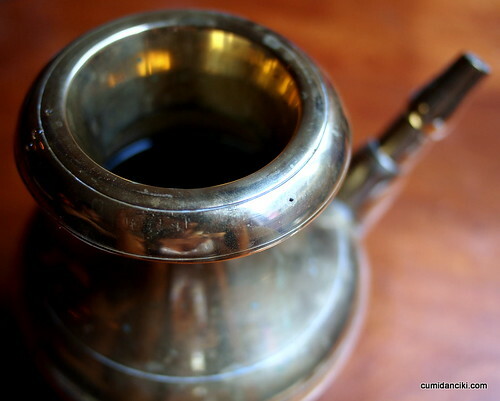 The most average Nepali people have this Dhedo as a meal. It is made of different kinds of flours, ranging from wheat to millet, which is boiled until thick. 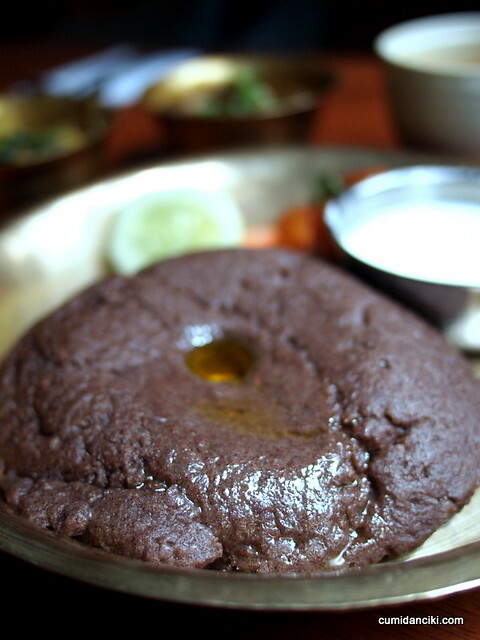 The Dhedo, in reality, we soon found, resembles half a sphere of a purple-brown substance with a crater-like indent at the top, filled with GHEE! This stodgy lump of thickened flour, will not suit everyone’s taste-buds, i.e. it has a slightly gummy and fibrous texture but bland taste (like saw dust maybe!) which amazingly went great with the accompanying curries and gundruk (vegetables). The Ghee actually adds lubrication and allows the dhedo to slide down your throat a little easier. Also, in the Himalayas it can get rather cold and Ghee doubles up as fuel for the body. Not many people take to the dhedo but I love it. 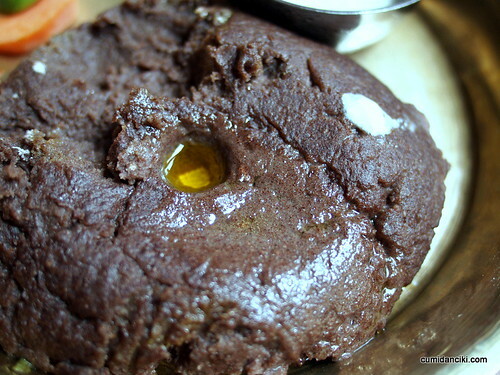 Strange but true – I love dunking it in the sourish yogurt and eating it with the super-salty lamb curry. Superb! You will notice that a lot of the meats tend to taste salty, like they have been cured. Because of harsh conditions prevailing in the highlands of the Himalayas, foods are preserved by dehydrating or fermenting staple ingredients during their growing season. Examples include Sukuti – dehydrated meat and Gundruk – fermented vegetables. This is why eating the strong tasting meats with other bland substitutes works so well in Nepali food. Meat usually is eaten a few times a month in small quantities. Sherpas and Tibetans eat more meat than other groups. Though rice is the staple, the Hill people tend to eat more dhedo, which is essentially mush made of cornmeal, millet, or buckwheat. Anyway, lunch was great, made even better by the company of @alilfatmonkey as well as @ladyironchef who was visiting from Singapore. There is actually a Part 2, 3, 4 and 5 to this eating carnival with our visitor, so stay tuned! Now I know where to find Nepalese food. BTW, I do have a Khukri at home. It was given to me at a Marketing conference in Nepal as a door gift. So inappropriate! The locals believe that once the Khukri is drawn, it has to draw blood. I guess we were all after each other’s blood at the Conference. 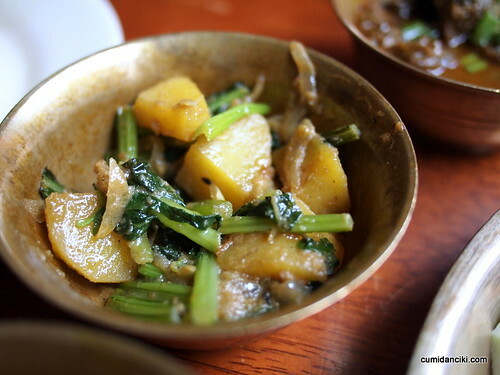 I would love to try Nepalese cuisine. Not so sure I’d be that keen on the Dhedo, but I’d at least give it a taste. My stop in KL this winter will be brief. I’ll be in Malacca for a few days, so I’ll to see what I can find there in the way of Nepalese restaurants. I doubt he’d be missing the food that quickly!LOL, but yeah, if u decide to go.. call me! My dear, you write this with such grace and respect for the Nepalese people and their culture (not to mention cuisine), it’s an inspiration. I was having breakfast with Devil in Imbi a couple of weekends ago, and I was wondering who are some of these people who live here? Would I recognise them – who is Nepalese, who is Myanmarese, and others? I know, we all need to count our blessings every single day. I saw Nepalese food here, and I you know I would have to make an effort to find an internet connection and comment. As you know Nepal is a very special place to me. “Khukri” is more of a blade / knife rather than dagger. Used by the infamous Gurkha soldiers. Some of the bravest and toughest fighters in the world. Infamous due to their heroic and little told efforts during World War 2 by the British. Momos are an absolute delight. Chicken being my favorite, the buff is a little gristly. So I am glad no one tried to give you Yak momo, as many tourists fall victim to “yak” steaks or great promise, only to actually get Buff, or Beef from Bangladesh. At least in Nepal. The dishes above are very reminiscent of Dal Baht. Which is actually the staple food of Nepal. Minus this dhedo think, which to be honest does not look like anything I have seen in Nepal. Apart from remote villages, where maybe it is still used. Rice is the real stable meal of Nepal. And, is apart of Dal Bhat which is eaten 3 times a day, or twice. In otherwords the daily meal “rarely” varies from this. Aside, that is for the tourists who can by half kilo steaks for $5. I have found the Nepalese people to be incredibly wonderful. Uncover the top layer, and you will find a people struggling to survive with a conflict of modern religion vs old vs caste systems vs a failed political system. And, a massive conflict between China and India over this tiny wonderful country. yeah, if the ladyironchef was on less of a hectic schedule, we could have eaten MORE! Momo looks like xiao long bao. I’m definitely coming here one of these days. So many things in KL I’m yet to try, it’s killing me. Hey, I am a girl from Nepal working here for the past few months and was going through some food blogs some weeks back for research and i came across this site and this blog about Nepali restaurant in KL and really made me nostalgic. 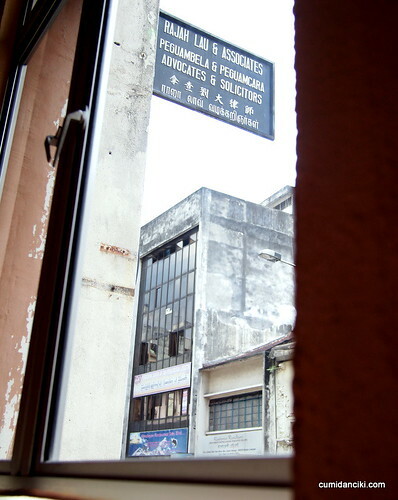 i so want to go there and i stay far from kl. As said by Dave, Dhedo is mostly taken in rural areas and dal (pulses), bhat (rice) with curry and achar (pickle) is taken as main two meals in a day apart from other snacks in between. thank u so much for the info and the way u describe it, it really is making me hungry. 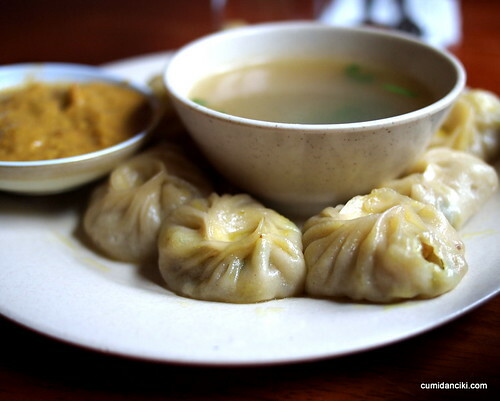 if you know other places that serves nepali food do let us know as i went to singapore few weeks back and i went to a nepali restaurant and they were easliy accesible and there were like 4 to 5 other nepali restaurants in the same area. it is a bit hard here to find nepali food. i am missing the taste.